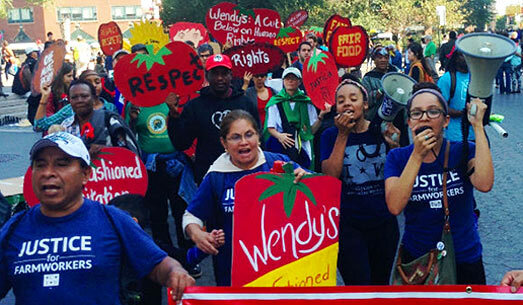 Four Freedoms Medal ceremony, massive Wendy’s protest, highlight week full of momentum in movement for Fair Food! There are days in the life of a struggle like the Campaign for Fair Food when resistance by the forces that would thwart change can feel almost suffocating. There are days when the task of building a more just world in the heart of the oppressive one it would replace can feel not just impossible, but even unimaginable. There are days when the fight can feel just too big. And then there are days like those the CIW spent this past week in New York City. On Tuesday, a delegation of CIW members and allies from Immokalee arrived in New York and proceeded to spend the next three days in a whirlwind of intense action for Fair Food, of festive celebration of twenty years of groundbreaking organizing, and of exciting planning around two new initiatives that promise to expand the boundaries of the fight for Fair Food ever outward. It was a good couple of days for Fair Food. For this past week, at least, the struggle launched 20 years ago in Immokalee, and joined today in communities across the country, moved forward on all fronts. … Wendy’s is the largest fast food chain in the country that has not signed such an agreement. The protest drew a remarkable amount of media attention in a city of more than 8 million people, including some great international and Spanish-language coverage. 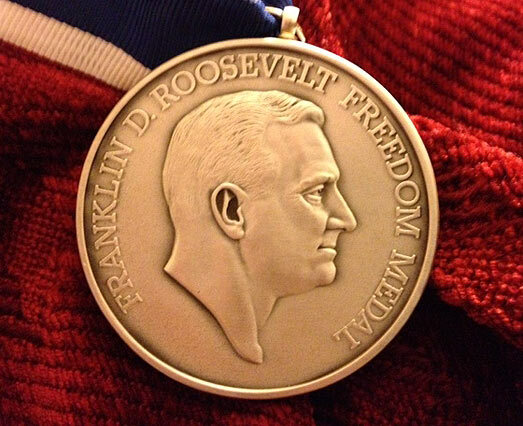 The highlight of the New York sojourn, though, was the unforgettable experience of receiving the 2013 Roosevelt Institute Freedom from Want Medal at a moving, Wednesday evening ceremony in the heart of Manhattan. And that doesn’t even begin to do the moment justice. Indeed, the ceremony, held under the timeless arches of the St. James’ Episcopal Church on the Upper East Side, was a highlight of our first twenty years of organizing, and those two decades have included quite a few crowning moments (like this, this, this, this, and this, just to name a few…). From meeting, and getting to know, Anna Eleanor Roosevelt — board chair of the Roosevelt Institute and granddaughter of Franklin and Eleanor Roosevelt — to spending time with our fellow laureates — Wendell Berry, Paul Krugman, Ameena Matthews, and Sister Simone Campbell — to sharing the moment with the many close friends and longtime allies who traveled to the city for the event, it was an extraordinary evening. RK: “Freedom from want” is more than being free from deprivation. What do your members hope for in their lives? CIW: Our members want nothing more, and nothing less, than to lead what most people would consider a “normal” life. Our members want to be able to provide their families with good food, a decent home, and a life they can enjoy together. Today, even though conditions are improving, farm labor remains a job that not only impoverishes workers economically, but socially as well, by demanding that workers be available from before dawn to after dusk. … RK: What has been the key to your success? CIW: The single most important factor in our success is that the Fair Food Program is truly a worker-designed, worker-driven social responsibility program. The vast majority of corporate social responsibility programs are created and controlled by corporations themselves, and so, quite simply, they are designed to protect the corporations’ interests. 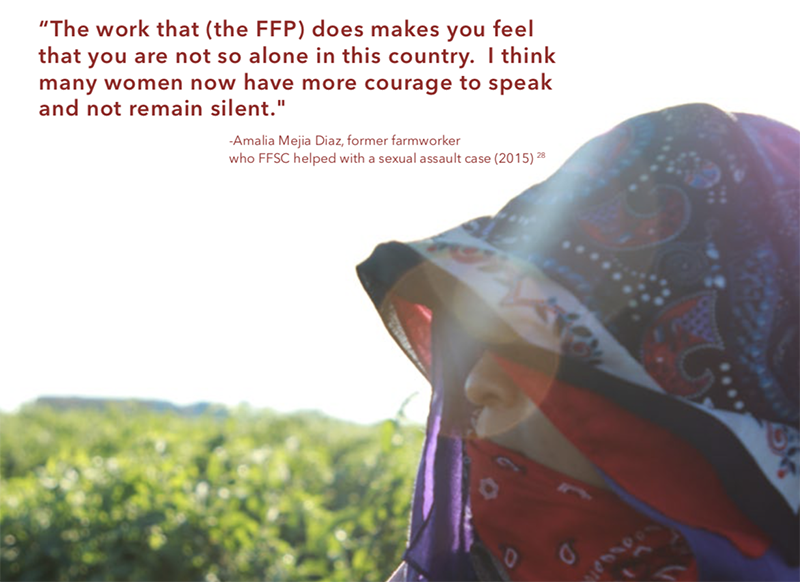 The Fair Food Program, with its principal architect being a workers’ organization, has a unique design and structure, all constructed with one goal in mind: to protect farmworkers’ rights. In doing that, the Fair Food Program also improves the agricultural industry as a whole, through direct economic benefits such as lower turnover and increased productivity, and through the marketing advantages created when an otherwise indistinguishable commodity becomes a product that can be differentiated on the supermarket shelf as having been produced under humane conditions. That makes the Fair Food Program uniquely effective as a means for protecting human rights and simultaneously uniquely attractive as a business model for growers and buyers looking to succeed in the 21st century marketplace. By Wednesday, though, the build up had run its course and it was time for the ceremony. And quite the ceremony it was. 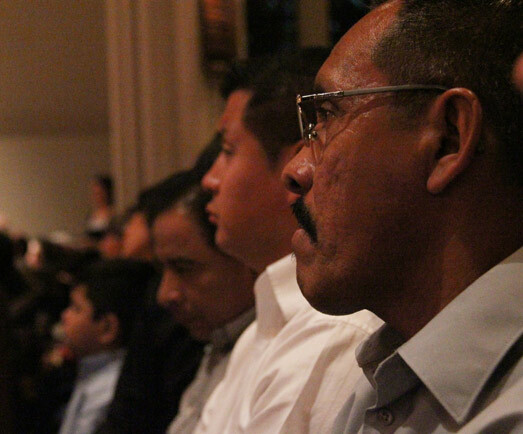 With dozens of CIW members and allies looking on from the pews — part of a crowd of 1,000 that filled the beautiful, two-hundred-year-old church — the CIW was recognized for its two decades of work on behalf of the human rights of farmworkers in Florida. 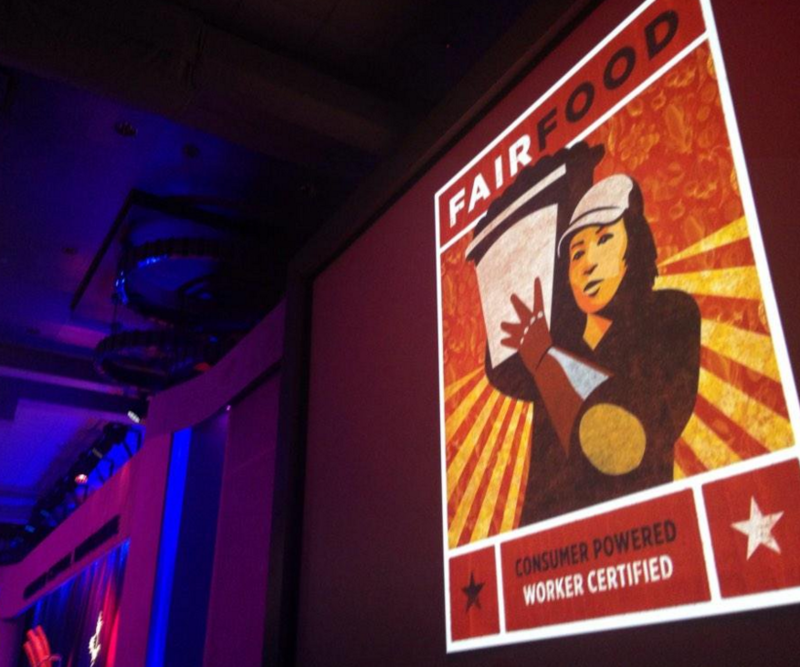 It was an evening of stirring speeches, moving memories, and exciting promise for the future of Fair Food. Below is the CIW’s portion of the event, though you can see the whole ceremony — including powerful messages from other laureates — at the Roosevelt Institute’s website. 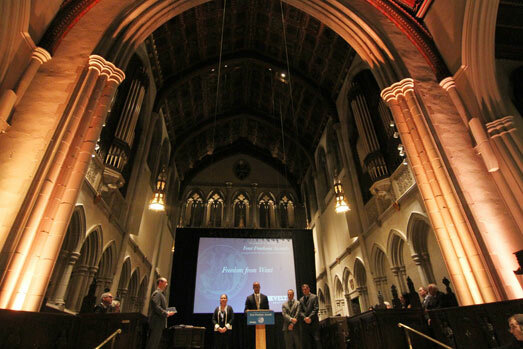 CIW members look on from the pews as CIW representatives accept the 2013 Roosevelt Freedom from Want Medal. 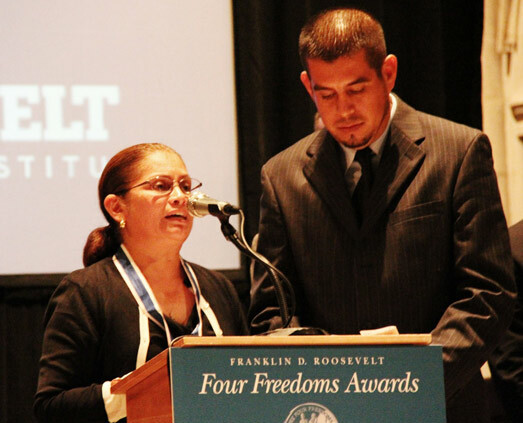 I was thrilled to see the Coalition of Immokalee Workers (CIW) honored at the Roosevelt Institute’s Four Freedom Awards on Wednesday night. Having followed the organization’s work for seven years, I believe their effectiveness is unmatched, and their achievements constantly offer a reason for hope. 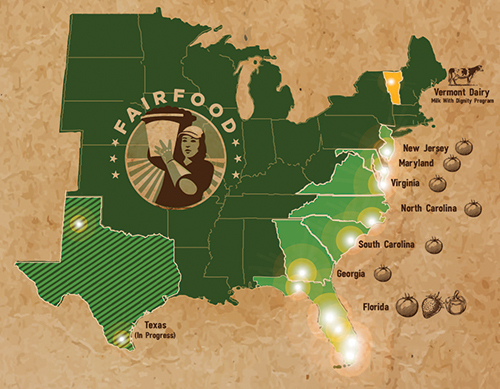 … In 2010, the Campaign for Fair Food evolved into a broader Fair Food Program—a new model of social responsibility. In addition to abiding by the penny-per-pound agreement—which has resulted in over $11 million in additional earnings for workers since January 2011—corporate buyers who sign on will purchase tomatoes only from growers who sign a code of conduct drafted by workers, in consultation with the growers and buyers. There is also worker-to-worker education on the new rights, and workers monitor their own workplaces. 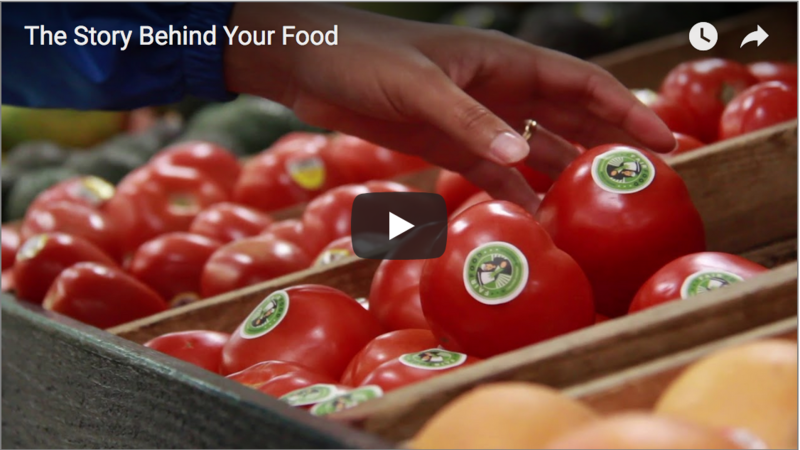 Under the agreement, the Fair Food Standards Council conducts regular audits, investigates complaints and monitors resolutions at the twenty-six participating growers—growers who account for 90 percent of the $650 million in revenues in the tomato industry. When major violations occur and aren’t corrected, corporations stop buying from those growers. (This model is similar to the one US retailers have refused to sign on to in the Bangladesh garment industry.) Through this system, four crew leaders with long histories of sexual harassment or labor abuse have been terminated, and supervisors at those companies were trained to address sexual harassment and other requirements under the Fair Food Program. 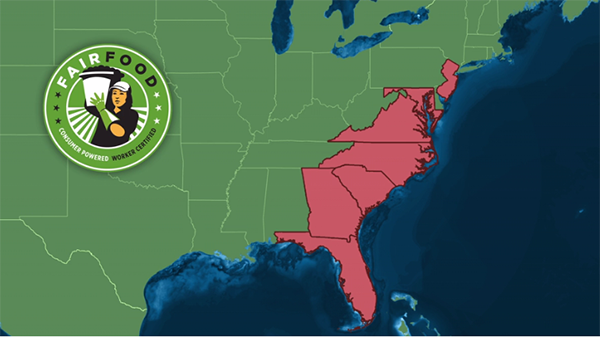 Finally, there is the CIW’s stunning anti-slavery campaign: since 1997, the group has assisted the Department of Justice in uncovering numerous multi-state slavery operations in the Southeastern United States. This work has resulted in the liberation of more than 1,200 workers and was a major factor in the passage of the Trafficking Victims Protection Act. The State Department recognized the CIW as “an independent and pressing voice as they uncover slavery rings, tap the power of the workers, and hold companies and governments accountable.” Now, with the Fair Food Program and the severe financial consequences for growers that are imposed when forced labor is discovered, Florida has evolved from what one federal prosecutor described as “ground zero for modern-day slavery” to having no cases of slavery over the past three years. The farmworkers began to gather every week in a room at Our Lady of Guadalupe Catholic Church in town. 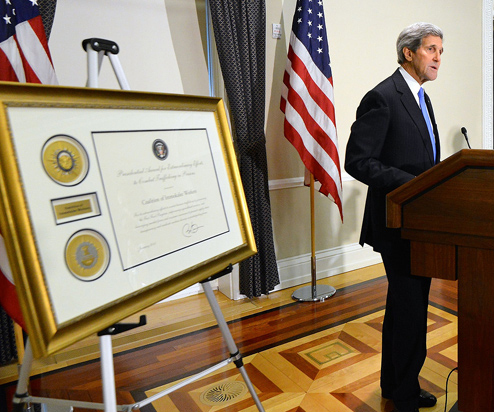 They would pass around the UN Universal Declaration of Human Rights—the preamble of which included FDR’s Four Freedoms. It’s a journey that shows us what it means to work directly—from the grassroots—with those most affected by poverty; what it means to set a seemingly unreachable bar and persevere; and what it means to understand your opposition and find new ways to challenge it. It was a magical night, and one that will be remembered for many years to come. 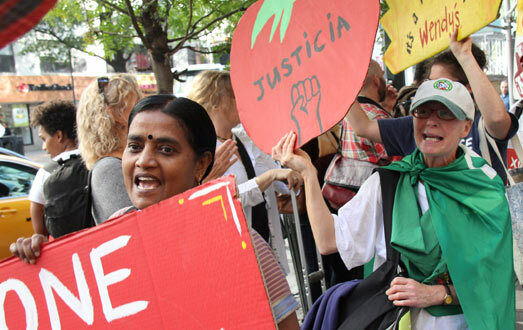 The recognition underscores the deep connection between the vision of a fairer world, predicated on universal respect for fundamental human rights, that animated Franklin and Eleanor Roosevelt’s life work and the vision of a fairer food system, predicated on respect for farmworkers’ human rights, that drives the Fair Food movement. 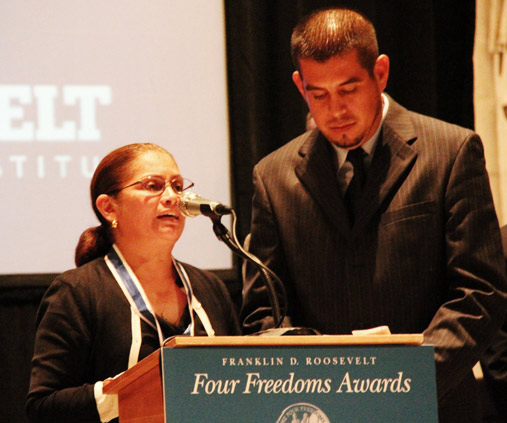 We thank Anna Roosevelt and everyone at the Roosevelt Institute for seeing that connection and choosing the CIW to receive the 2013 Freedom from Want Medal.